European car sales have been on a wild ride in the second half of 2018, due to the introduction in September of a new fuel efficiency and emissions testing standard called WLTP (Worldwide harmonized Light vehicle Test Procedure), to which many manufacturers have found themselves unprepared. After September 1st , only vehicle types that had been tested under the new standard were allowed to be sold as new vehicles in Europe. That meant that every version of every model sold in the continent needed to be retested, but despite working round the clock, the testing agencies just didn’t have enough capacity to get this done in time. With some vehicle/engine combinations “illegal” after September 1st, automakers rushed to register these vehicles in August, leading to a 26,4% sales gain in what’s usually the slowest month of the year by far. However, as these unsold vehicles still needed to end up in consumers’ hands, sales in September suffered a backdrop of 23,1% as for the first time in modern history fewer cars were sold in September than in August. In the following months, sales continued to suffer from the continued backlog of pre-registered but unsold vehicles as well as reduced availability of certain model/engine combinations. Some manufacturers have been hit harder than others, with VW Group and Renault-Nissan among the hardest hit by the new testing procedures. After discussing the US auto brand sales ranking for November, let’s zoom in on the models ranking. November saw some unexpected sales surges in the Top 10. While nothing exciting happened in the Top 3, five of the remaining seven models registered growth rates of over 20%! Of these the sales growth experienced by the new Toyota Camry is fully expected, as the new more exciting model seems to be getting early purchase with customers, while the new Honda CR-V is once again seeing good sales growth. 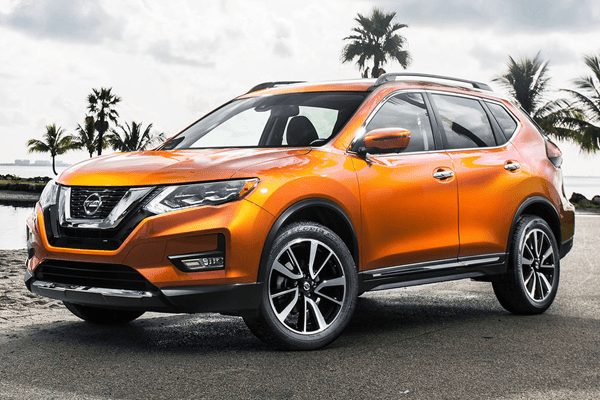 The bigger surprises came from market stalwarts such as Nissan Rogue, whose sales were up by over 35% and which came within 1,000 units of outselling Ram Pickup in third, as well as Honda Civic and Ford Explorer, the latter of which placed in the Top 10 for the first time ever! (In fact, it may be the first time a Mid-sized SUV has placed in the Top 10, a place normally occupied by Large Pickups, Compact and Mid-sized cars, and Compact SUVs. By comparison, Toyota RAV4 and Ford Escape had a quiet month in eight and ninth place. The see-sawing we have observed in the US market in the past few months continued in November, with a sales increase of 1.4%. This follows a decline in October, growth in September, and eight straight months of decline before that. 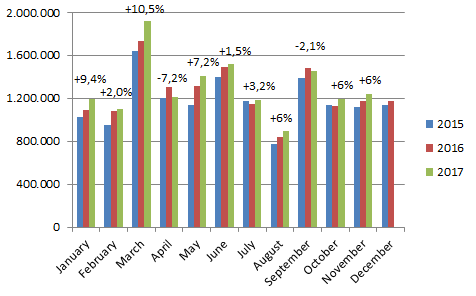 As a result of the larger decline in sales earlier in the year the market is still down 1.2% YTD, but this still looks much better than the position it was just four months ago in July, when it was down 2.6% YTD. It is still much too early to talk about a recovery per se, but the signs are the worst decline has been halted for now. After analysing European car sales for November 2016 by brand, let’s check out what the model ranking looks like. The Renault Clio celebrates its best November ever in 2nd place behint the traditional leader Volkswagen Golf, and ahead of its segment rivals Volkswagen Polo and Ford Fiesta. The Opel/Vauxhall Astra is in 5th place for the second month in a row, followed by the Skoda Octavia, also with its best November ever. The Volkswagen Tiguan drops a position on last month, but celebrates its fourth straight month in the European top-10, while the Renault Captur is the 2nd best selling crossover in the continent, back in the top-10 for the first time since June, with – you guessed it – its best November ever. The same goes for the Nissan Qashqai by the way, right behind the Captur in 11th place. The Fiat Panda hits its best ranking since February in 12th place while its sibling Fiat 500 is down in 29th place. The Renault Megane (#14) doubles up its volume of last year and outsells the Peugeot 308 (#20) for the first time since June 2014 and the Ford Focus (#15) for the first time since December 2012. The Opel/Vauxhall Mokka (#21) outsells its rival Peugeot 2008 (#22) for only the third time this year, with the Dacia Duster (#25) not far behind.